Tuned to the poignant notes of an aria by Italian composer Giuseppe Verdi. The Woodstock Chimes of Tuscany's enchanting sounds will be embraced whenever and wherever the wind blows. 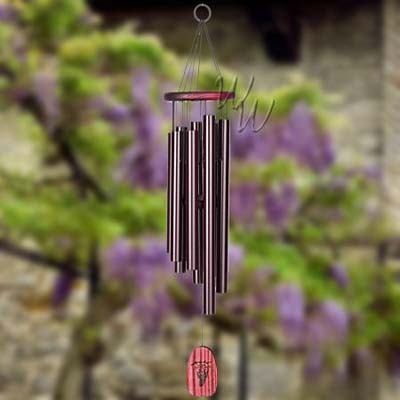 Our Chimes of Tuscany are beautiful to look at and echo the sounds of Italy during even the slightest breeze. The chime features an image of grapes burned into the wood of the windcatcher. Materials: Burgundy-washed ash wood, 9 matte burgundy tubes.